One of the great things about episodic shows like Aria is that OVAs don't actually seem out of place within the context of the overall story. This special is a great example of this, and a wonderful stand alone tale that actually adds to the overall show, something of an achievement given the glut of OVAs from popular series that are nothing more than filler and fluff. Now one could argue that this OVA is nothing more than fluff, but given the "feelgood" nature of the entire series I found this episode fitted into the world of Aria rather nicely. The story is very short and simple. Akari and President Aria take a walk around Neo Venezia and end up at St Mark's Basilica where Akari decides to show President Aria her "secret hideout". Along the way though, they are surreptitiously followed by Akatsuki, Aika and Alice. 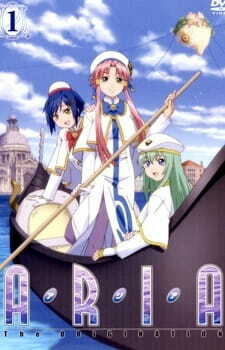 The art and animation are typical Aria, with all that entails. Granted this is only a single episode, but it seems that as much effort has gone into making this special as has gone into making the series proper. Because of this there are some breathtaking panoramic views of Neo Venezia towards the end of the OVA. Sound is, again, what one would expect from the series. The level and quality of the music and effects are of an extremely high standard, and the voice actors perform their roles with just as much aplomb as they do in the main series. There isn't really much to say about characters in this OVA, however one point does stand out - how much Akari has come to love Neo Venezia, and Aqua in general. This point is very subtly emphasised throughout the episode and, in true Aria style, nothing is ever forced or melodramatic. Now most people will have already realised that I like the Aria franchise in all its splendour, but I can't help but feel a twinge of sadness that this episode is effectively the end of the line. The strange thing is that there is a subtly bittersweet undertone to this OVA that is reflected in Akari's love for Neo Venezia and Aqua, and the glorious panoramas of the city feel more like a fond farewell than anything else. Aria fans should definitely watch this special as it is a great addition to the franchise, and the nature of the series means that even those who have never watched Aria before will find the OVA accessible. Fluff it may be, but it's good, enjoyable and relaxing fluff - something of a rarity in anime these days. Ah, all the nostalgia is coming back. Good times, good times. This being a one-episode DVD special, one would think story would be complete filler. But then, this is a slice-of-life show, where things are episodic, and very few plotlines actually last. Anyhow there isn't much to write about here without giving things away. Suffice to say it's about Akari's secret place. Worthy of a DVD special. Animation is top notch, the background is as usual gorgeous, detailed and extremely accurate when compared to the real-life counterpart, and there are no errors as far as I've seen. Exemplary, just like the rest of the Aria series. Every BGM piece matches the scene very well. The insert song however is forgettable, though it certainly doesn't jar the ears. Once again the Goddess that is Akari manages to effortlessly draw us in into her world and gives us a front-seat view of what she sees. And what she sees is a beautiful world brimming with positivity, with more than a healthy tinge of mono no aware. The only issue I have is that the other characters in this episode are overshadowed, but then this wasn't exactly an episode about them. I enjoyed this immensely. Charming atmosphere, soothing music, great animation, Akari. Couldn't have asked for more.